The eighteenth century struggled to define architecture as either an art or a science — the image of the architect as a grand figure who synthesizes all other disciplines within a single master plan emerged from this discourse. Immanuel Kant and Johann Wolfgang Goethe described the architect as their equal, a genius with godlike creativity. For writers from Descartes to Freud, architectural reasoning provided a method for critically examining consciousness. The architect, as philosophers liked to think of him, was obligated by the design and construction process to mediate between the abstract and the actual. In On the Ruins of Babel, Daniel Purdy traces this notion back to its wellspring. He surveys the volatile state of architectural theory in the Enlightenment, brought on by the newly emerged scientific critiques of Renaissance cosmology, then shows how German writers redeployed Renaissance terminology so that "harmony," "unity," "synthesis," "foundation," and "orderliness" became states of consciousness, rather than terms used to describe the built world. 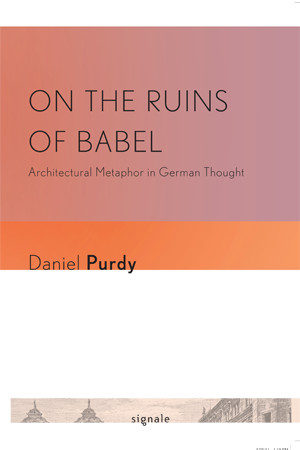 Purdy's distinctly new interpretation of German theory reveals how metaphors constitute interior life as an architectural space to be designed, constructed, renovated, or demolished. He elucidates the close affinity between Hegel's Romantic aesthetic of space and Daniel Libeskind's deconstruction of monumental architecture in Berlin's Jewish Museum. Through a careful reading of Walter Benjamin's writing on architecture as myth, Purdy details how classical architecture shaped Benjamin's modernist interpretations of urban life, particularly his elaboration on Freud's archaeology of the unconscious. Benjamin's essays on dreams and architecture turn the individualist sensibility of the Enlightenment into a collective and mythic identification between humans and buildings. Daniel Purdy is Director of Graduate German Studies at Penn State University. He is the author of The Tyranny of Elegance: Consumer Cosmopolitanism in the Era of Goethe and editor of The Rise of Fashion.